Award Winning Coach Tom Hofman reaches over 700 wins making him one of the 30 winningest coaches in California. 33 consecutive CIF playoff appearances. Are you looking for a great activity once it is time to put the schoolbooks away? Play basketball in an atmosphere where you can’t help but improve. Former members from Coach Tom Hofman’s 26-time Rio Hondo League champion Spartans, along with a select group of college players, will be among the counselors. This is far and away the most popular youth basketball camp in the entire Valley. Nearly 300 boys and girls attended last summer! Players acquire new skills, refine skills previously learned, build self-esteem, have fun, and go home with a smile! 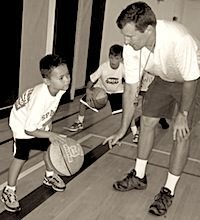 Each afternoon for five days, you will be drilled on correct techniques of ball handling, shooting, passing, offense, defense and more. Our goal is to provide our campers with instruction that can be used all year long. This sport can build their self-confidence and motivate them to push themselves farther, which can be invaluable as a life experience beyond basketball. League play takes place during the final hour each day during which you will apply the new skills you have learned throughout the day.Your team coach for the games will evaluate your skills after each game, giving immediate feedback. Additionally, SPARTAN BASKETBALL CAMP will have a camper-to-coach ratio of approximately 8-to-1, providing more individual teaching than most of the larger basketball camps. A final evaluation will be conducted on Friday, at which time your coach will assess your strengths and weaknesses, which will help guide players as to what they should concentrate on during the off-season to become an even better player. The week’s final games will be played and trophies will be presented to each player in front of friends and family at the Awards Ceremony. Every player will receive a trophy. Learn more about our camps! La Cañada, California. We are currently on our 33rd consecutive camp hosted by award winning coach, Tom Hofman, La Cañada High School’s varsity basketball coach and the camp’s director, who has turned the Spartans into a Southern California basketball power. If you have any questions or special requests please do not hesitate to contact us.